Walking through the Burano island of Veneto the vibrant colors of the houses is invigorating to the spirit. No one knows when or why the tradition of painting the houses originally started, but like all good things, there is a legend behind. March 2014, single image, additional exposures for highlights, focal length 25mm, aperture f/11, shutter speed 30 seconds, ISO 100, tripod. Legend goes due to the fog that would surround these houses, fishermen could not recognise their homes when returning from the sea. The citizens responded by painting them vibrant colors. Painting your house an unconventional color does not come without restrictions in Burano. One must submit a formal request to the government which will decide whether the color is permitted for that lot. This organization is part of the reason there can be so many different colors of houses that seemingly go together. You would think with this visual eye candy of Burano it’d be easy to find a place to take a photo, but I had such a hard time. I just could not find a good composition. I tried photos with and without canals, with and without bridges, and more. At the sunset I felt the pressure building. Luckily, I found this composition with the Burano houses along with the famous titled bell tower, the Chiesa di San Martino. The drain hatch served as a nice foreground element. Cobblestones created leading lines towards the church. The handful of small colorful facades serves as a great part of the background. 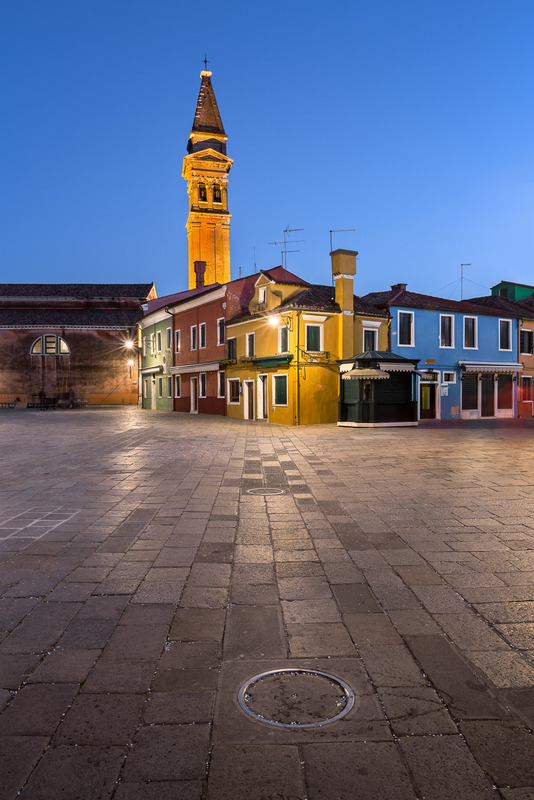 The result is rather unusual composition showing the colorful Burano houses together with the old grey bell tower typical for the historic Venice. This entry was posted in City.